While most tooth loss stems from dental disease or injury, another major cause is a condition known as cracked tooth syndrome. What begins as a microscopic crack in an individual tooth’s enamel could ultimately grow to a fracture that endangers its survival. Most often related to age-related brittleness, expansion and contraction of the enamel surface because of hot foods followed by cold foods and beverages, or grinding habits, cracked tooth syndrome usually occurs in three phases. The first phase is the emergence of miniscule cracks in the outer enamel known as craze lines. These can be very difficult to detect even with x-rays, and usually calls for specialized detection methods such as probing with a sharp instrument (an explorer) or fiber-optic lighting with dye staining to highlight enamel abnormalities. If you have pain symptoms, we may ask you to bite down on a bite stick or rubber pad to locate the area by replicating the sensation. In the next phase, the craze line grows into a crack that penetrates below the enamel into the tooth’s dentin. Pain becomes more prominent and the risk of infection increases. Left untreated, the crack may enter the third phase, a full break (fracture) occurring deep within the inner layers of the tooth. 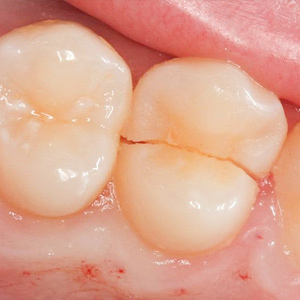 The deeper the fracture occurs, the more serious the danger to the tooth, especially if the pulp is exposed. The best treatment approach is to attempt to detect and treat a crack as early as possible. Craze lines and moderate cracks can usually be repaired with restorative materials like composite resins. A deeper crack extending into the pulp may require a root canal treatment and the tooth covered with a permanent, protective crown. 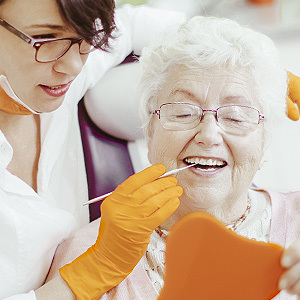 If, however, the fracture is too deep, the tooth may be beyond repair and will need to be extracted and replaced with a dental implant or permanent bridge. In any event, the sooner a cracked tooth is discovered and treated, the greater your chance of avoiding pain, discomfort, and, ultimately, tooth loss.